I came home and the question kept nagging me. I had been thinking about it for a few days and had one of those head-slapping moments while yelling a big “Duh!! 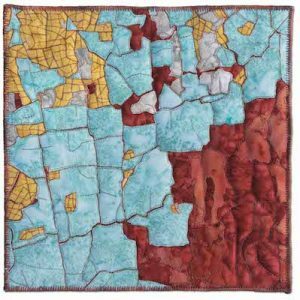 !” Even though my piece is not close to the beauties she produces, evidently I was channeling the quilter Sandra Bruce and didn’t even realize it until that moment!! Two inch squares, who would have thought! I can’t believe I truly didn’t realize how much Sandra had influenced the construction of this piece! I belong to a quilt association that was lucky enough to have her come to speak and teach at the end of last year. I absolutely love her matrix quilts that break down photos into two inch square segments. They are just fabulous! Thank you, Sandra for the inspiration whether I was initially aware of it or not! If you’d like to see her amazing quilts, check out her Facebook page or her website. (You really should!) She also has a quilt (make that two) hanging in the Houston show! 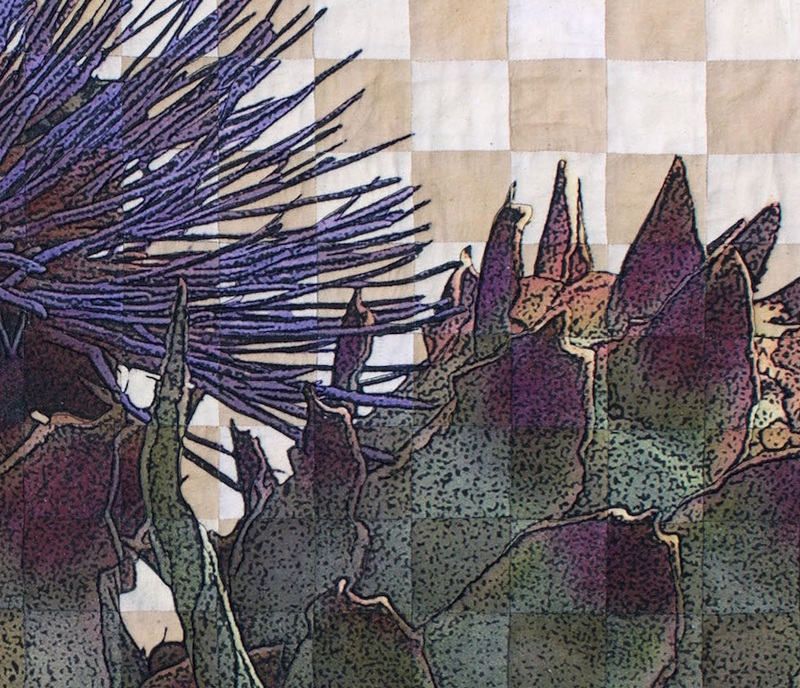 My quilt is called Cynara. This is only a portion of the quilt. I’ll post a picture of the whole thing soon. Here’s the story: While visiting his brother Poseidon, Zeus fell in love with Cynara, a beautiful young mortal woman. He took her to Olympus and made her a goddess so that he could have his bit on the side while Hera was out of town. Sadly, Cynara missed her home and would sneak back to earth to visit her family. 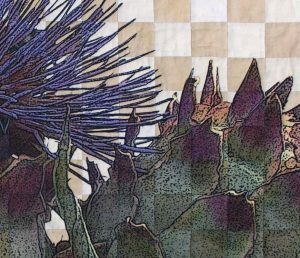 Discovering this so angered Zeus he sent her back to earth and turned her into an artichoke – the very first artichoke. So, this is Cynara complete with her checkered past. It’s a fact of life that when you start entering your artwork into challenges and shows you are inviting rejection as well as some potential good stuff. Well, I invited it and got rejected twice within a week! Now, the good news is I did get one quilt into the Houston quilt show and that does feel good but back to rejection. I know clearly that rejection is part of the process. It does make the times you are accepted more worthy of note. It’s a chance for mulling over the piece, examining how you really feel about the work, and an opportunity to ask yourself those questions that include could I or would I have done anything differently? 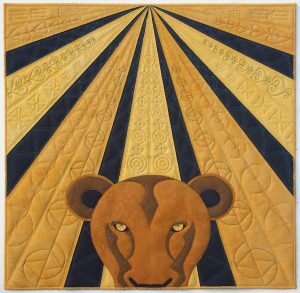 My first rejection of the week came from the Lion King challenge put on by Cherrywood Fabrics. I have to admit I knew that it wouldn’t make the cut pretty much from the beginning but decided not to let that stop me. This really was an exercise in completion. I’m not sure why I made some of the decisions I did, but this quilt does not play to my strengths at all and really reflects very little of who I am as a quilter and artist. I chose to let it push me in different directions and, perhaps, that’s why I like it – I know what a struggle I had getting to this point! It was my problem child! I also discovered that playing in this kind of challenge is not so much in my wheelhouse. I was given the four fabrics, the size, and subject matter and I reacted the way I did back in my past when I accepted a few jobs to make clothing for hire – I was given the fabric and the pattern and then dug in my heels and just felt resentful. It was now a chore. Resentful sewing is not fun! Also, the fact that I liked the back more than the front was probably a good indication of how I felt about the quilt! The rejected quilt is called I See You. Growing up is difficult under the best of circumstances. 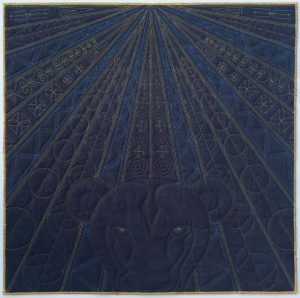 The West African symbols quilted into the rays from the top to the center mean: persistently attempting the impossible, learning to listen and understand, having courage, learning from the past to fix mistakes, a lot of good luck, aiming high, and embracing change. Who we are, who we become is influenced by all these things. They lead us to our own personal greatness where we can see how we fit in the world and where others can see us for who we truly are. The new exhibits are up at the San Jose Museum of Quilts and Textiles! If you get the chance and are in the area, you really should get to the museum. The primary exhibit is Wedding Dress: Yesterday, Today and Tomorrow. 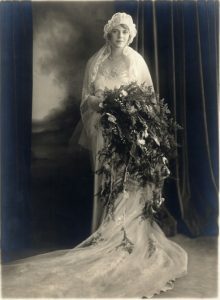 There is clothing from the 1800s on, wedding clothing from other countries as well as some unconventional wedding items. There is also a tremendous exhibit of Mike McNamara’s very different wedding ring quilts and the stories behind them along with his mom’s wedding dress (gorgeous). The other exhibit opening is Jazz Impressions that is running in conjunction with the San Jose Jazz Festival. The jazz inspired quilts on display were made by members of the Santa Clara Valley Quilt Association. I’m lucky enough to have two quilts in this exhibit. 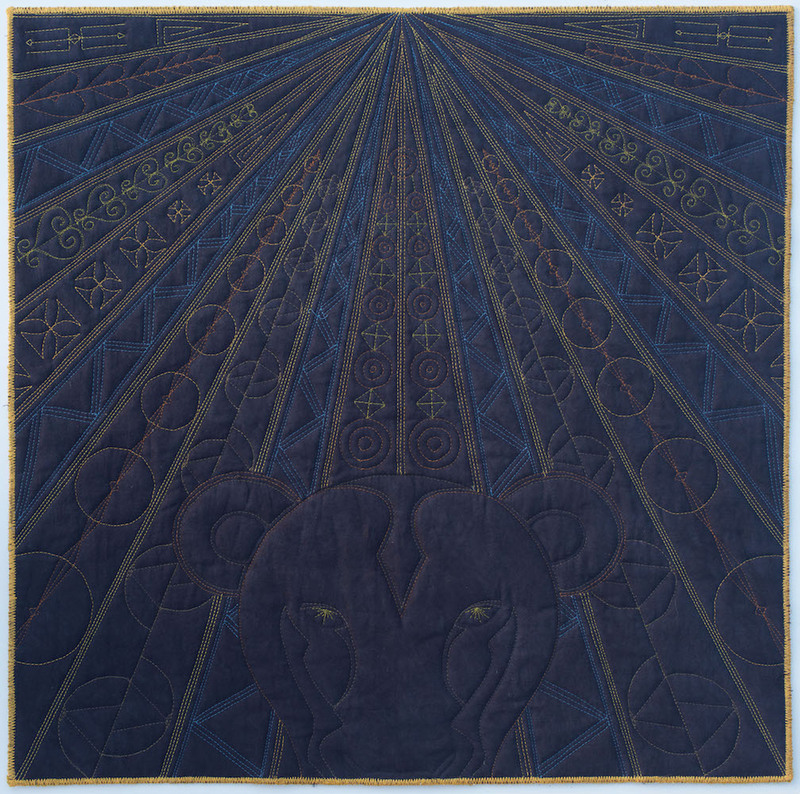 My second quilt is another digitally printed quilt that I talked about in my last post entitled God Is in the House. Hope to see you at the museum! Just finished my latest quilt! It’s one of two that I’m hoping will make it into the exhibit coming up in July at the San Jose Museum of Quilts and Textiles. The exhibit is being run to coincide with the San Jose Jazz Festival and is called Jazz Impressions. 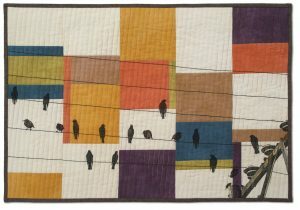 The show will be jazz inspired quilts made by members of the Santa Clara Valley Quilt Association, a group of 500+ quilt makers and enthusiasts. 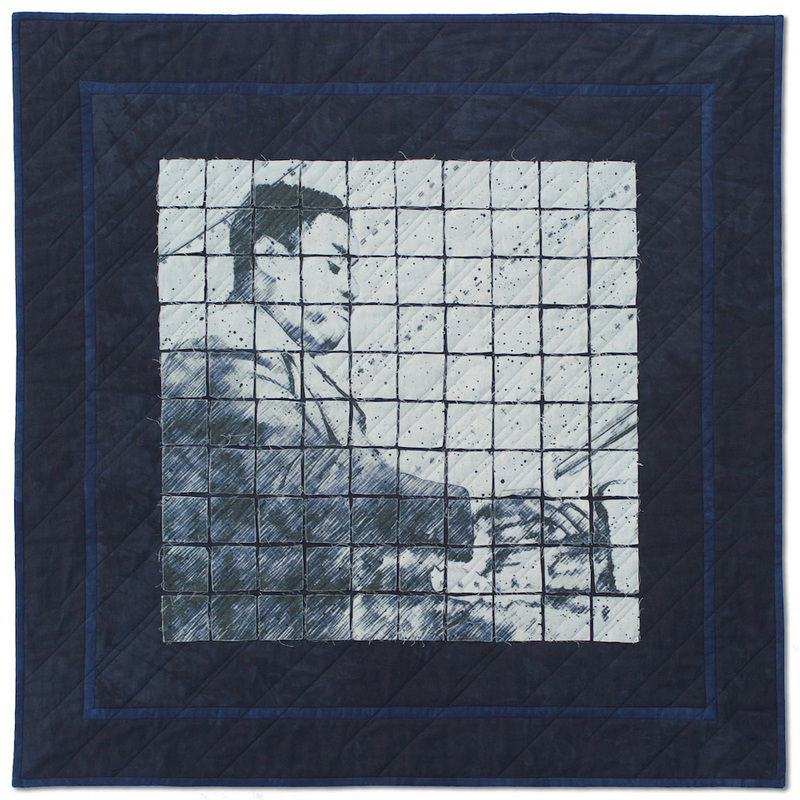 The quilt is from a photograph taken by William Gottlieb of Art Tatum. Gottlieb was best known for his portraits of leading jazz musicians during the 1930’s and 1940’s taken during performances in various New York City jazz clubs. Upon his death, Gottlieb had his photographs put into the public domain. What a gift! Art Tatum was born in 1909 and died at only 47 years of age in 1956. 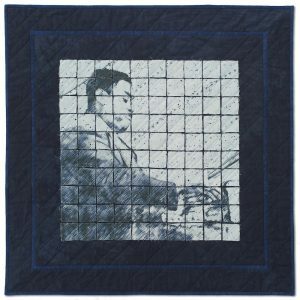 He is still considered to be one of the greatest jazz pianists to ever perform and his playing style is still studied and emulated. The title of this piece comes from this story. “The great stride pianist Fats Waller famously announced one night when Tatum walked into the club where Waller was playing, ‘I only play the piano, but tonight God is in the house.’” (John Burnett. “Art Tatum: A Talent Never to Be Duplicated”. NPR.) So, here it is – my newest, God Is in the House. 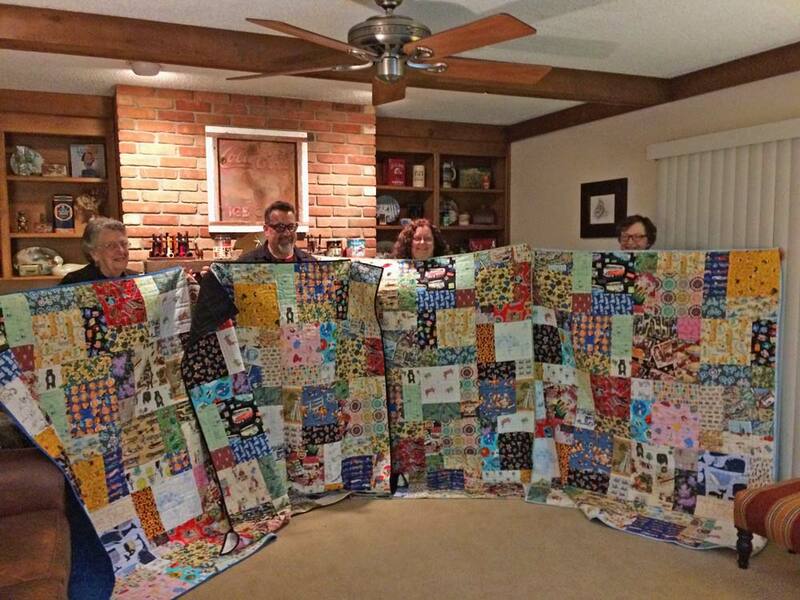 A friend of mine has been so good lately starting and completing one quilt at a time. Very inspiring! I know it won’t completely work for me as I like jumping from one project to the next, but I really do need to complete some of these! I keep hearing Maria Shell’s voice in my head discussing time management. I took a class with her last year on that topic and it’s taken me this long to attempt to process all I heard and see how it will work for me. It’s time to put some of these tips into practice! I sat down yesterday and actually made a spreadsheet of what remains to be done on each of the quilts I’m currently working on with the drop-dead date for each of them. Ended up realizing that there were several ideas from last year that needed to be added to this year’s list. It’s now completely unrealistic, but I’ll focus on finishing the ones started recently and hope for the best! What’s that? You think that I should have spent my time sewing instead of doing this? I’ll have you know I even managed to get some sewing time in as well as a very nice nap! I’m curious, how do my fellow creative types prefer to work? Anything less than 20 years is gold! It has been a week for talking to family (biological and chosen), planning trips to see family, and thinking about family. All in all, not a bad occupation! Seems like the perfect time to tell you about a family quilting project. In September of 2012, I sent my two sisters and my brother an email asking for each of their favorite colors (limit three) and 10-20 one to five word memories of our childhood. I did tell them I had an idea for a project and that it would probably take me about 20 years to complete. The fact that it only took me three years to complete I think of as a huge accomplishment! I made a spreadsheet to keep track of our memories and then started looking around online to see what fabrics were out there that represented some of them. I ended up drawing some and having Spoonflower reproduce them on fabric, even ended up printing up some fabric of my own, and managed to find fabrics that represented just about all the other collected memories. Some of my favorite finds were vintage fabrics – two Disneyland fabrics and one commemorating the moon landing from an old set of curtains. Only three memories didn’t make it into the quilt. Cap guns (no matter how I drew it, it just looked like a gun), kick fights (yes, my older sister and I used to hold on to each other’s hair and kick away when angry – but only if Mom wasn’t watching), and some glorious, highly unsafe rocking horses my dad made for us that just didn’t translate well either. Trying to get those three included would have probably added two years to the project! I had every intention of making four quilts inspired by either Mike McNamara or Joe Cunningham but in the end, I had too many fabrics to wrap my head around. I ended up going for quick and dirty and decided on a very large Disappearing 9-Patch so that my head wouldn’t explode. Each quilt consists of 20 blocks with four different fabrics in each block. I think I only ended up repeating about 4-5 fabrics in the quilt. It was VERY easy. I would make one 9-patch and cut it into fourths. There was one block for each quilt. We were all together at the beginning of November last year and it was the perfect time to pass them on. Not gorgeous, but so much fun! Entering quilts into shows is actually a pretty new thing for me – at least compared to my age. The first time I entered was because I thought that the quilt I had made was worth being seen by others and that specific feeling was stronger than any fear I had of opening myself up to other’s opinions. The first show I entered was in 2012. There are three shows I’ve “built up” to over the past 4 years and I thought I’d try to add another this year. 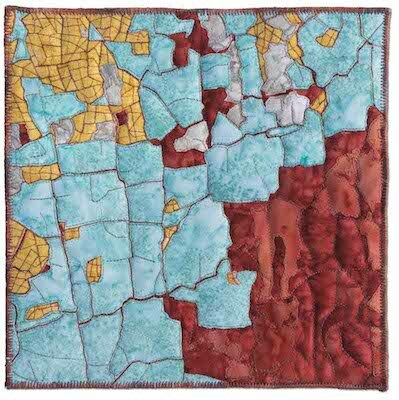 I submitted a quilt to the AQS show in Paducah and I got the notification this week that my entry made it in! What’s so completely ridiculous is that it has given me just enough validation to lead to a profusion of ideas and now I have a crap load of quilts in progress! 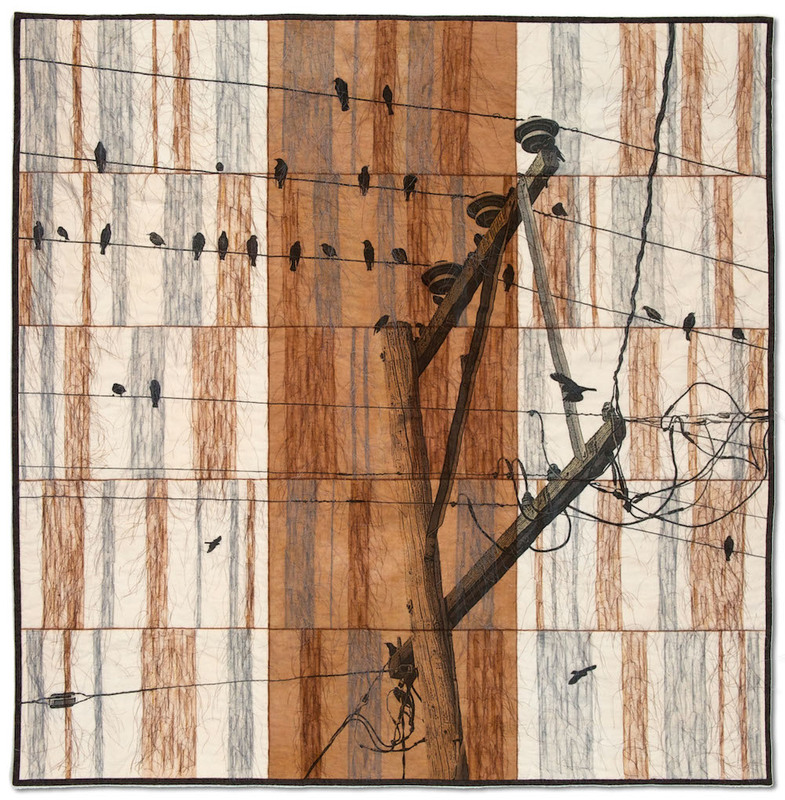 The quilt that will be hanging in Paducah is High Voltage Birds. Seems like a good time to tell you how it came about. I had an idea in my head to do this digitally printed, multi-panel, two color quilt for a while and had my mind made up that it had to be a winter tree – bare branches, lots of negative space – I can still see it. That started my search for the perfect tree. Living in California didn’t give me too many options for those big, leafless trees out in wide open spaces. Traveling to other states gave me some “almost rights” but nothing I wanted to use. This went on for almost two years. Then one day my husband and I drove along the coast and stopped in Pescadero – a couple of great little shops, freshly made artichoke bread, a little farm that makes incredible goat cheese. 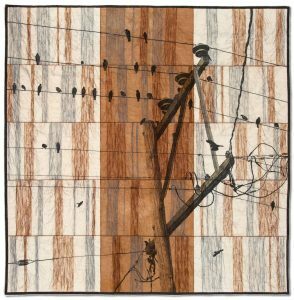 My husband made me go down a back street to take some pictures of rusted metal and peeling paint (yes, I was feeling cranky and wanted to go home) when I happened to look down the street a bit – the telephone pole and birds – my urban tree. I ended up taking masses of photos and then home to play in Photoshop! I hope this quilt has a good time visiting Kentucky. Not sure yet if I’m going to be able to make it there to visit. I thought I’d tell you about some of my pieces over the next few months. This is my latest made for the FiberShot challenge and sale at the San Jose Museum of Quilts and Textiles. All donated quilts will be hung in the museum and available for sale beginning on March 11th. It’s for a great cause and it’s a chance to own some pretty special pieces! The background – My husband and I were on a trip and passed through Mansfield, Ohio and stopped at the Ohio State Reformatory. Not the one still in use, but the one next door that was completed in 1834, housed prisoners throughout the Civil War years, once held a prisoner that wrote under the pseudonym O. Henry, and was finally closed as a functioning prison in 1972. It’s now an historic landmark and used for films, music videos, and television shows – most notably, The Shawshank Redemption. Walking through the prison was a little disturbing, but it was interesting seeing what rooms had been converted for the film to the warden’s office, the hotel room the men were sent to once released, etc. It’s February…Happy New Year anyway! With all the craziness that makes up life, it’s been a long time between posts! So much for my budding career as a blogger! Creatively, it’s been a good beginning to the year. I’ve just finished two small quilts (to be seen later) and lots more ideas are percolating. I’m sure I’m like a lot of you in that sometimes I need to jumpstart my creativity by seeking out a challenge or two. 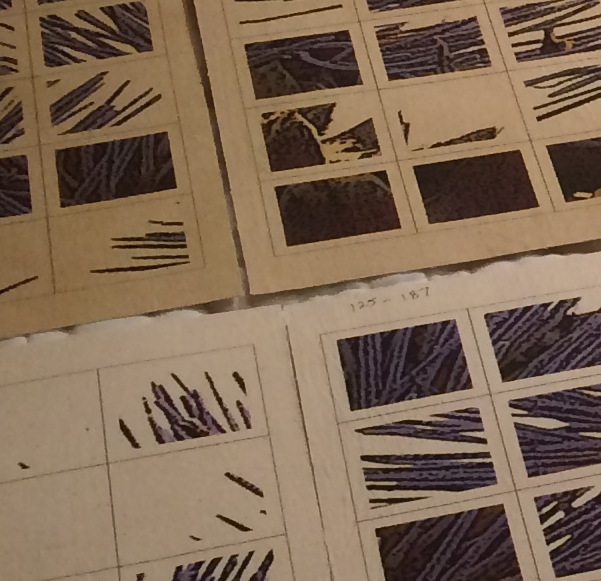 I love getting involved in the planning process of “how could I approach that?” Or, “could that really work?” Truly, that is probably one of the most exciting phases of any project for me, the obsessive thinking stage! I love planning it all out in my head before sitting down to sew – will I press the seams open, will that edging work, which paint will give the right look, will that fit through my printer – I miss a lot of what my husband says to me during this time! 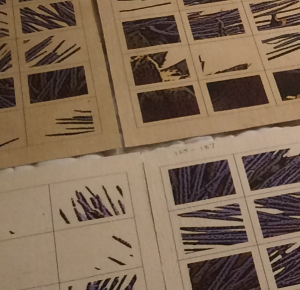 Of course, in spite of this ridiculous over planning, I always have to make adjustments and changes during the actual making of whatever I’m working on. I love hearing how other people work. I love getting to listen to artists (especially art quilters) talk about their creative process. It gives me a fresh perspective. In a silly way, it helps me to accept my own way of approaching projects and gives me some new tools to play with. Would love to hear about yours! I’m just back from my first time going to the International Quilt Festival in Houston and, as my mind and body are still spinning from all I’ve seen, I think it’s only right and proper to begin writing now! I knew that this was the largest show in the states but this year was even bigger. As it was celebrating it’s 40th year, there were even more quilts that usual – around 2,000. After 5 days, I still don’t think I’d really seen them all. Every morning I’d get up ready to see a section I hadn’t seen before. Every morning while walking to that new section I just had to run by some favorites from the day before and revisit them. Every day I’d see some quilts in sections that I’d already walked through that I didn’t remember seeing before and that I loved. Hours later I might make it to the “new” section! In addition to being my first time at the show, it was my first time of going to a show without the buffer of a friend. Sounds silly, but that meant I had decisions to make – I could be lonely or make new friends. Don’t get me wrong, I like my quiet time, but just not a week of quiet time! I connected with wonderful people from my hometown guild that were gracious enough to include me in some of their plans, met wonderful people that I’m hoping will grow into new friends, and had coffee with great people that I met in line while waiting for our daily fix of caffeine – those brief connections that won’t really go anywhere but just make you glad that there are people like that in the world.